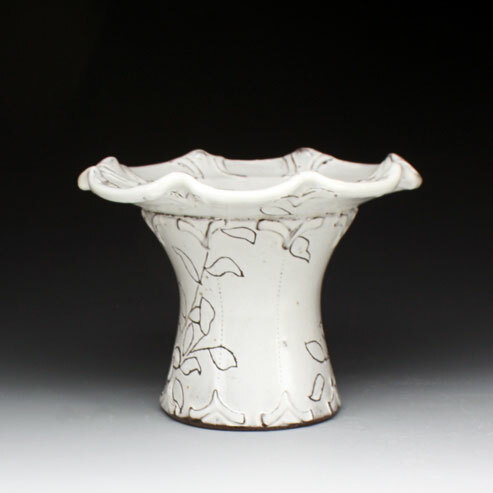 Ben Carter employs a heavily grogged clay from the province of Yixing, usually reserved for making big pots. He sieves the clay, making it easier to manipulate at an intimate scale, while retaining the rich color and history of Yixing renown. Teapots are almost synonymous with this clay body and Carter builds on, not only the Yixing tradition, but also on the tradition of tea. He cross-pollinates sets and forms from across the globe. “In Full Bloom” presents us with tea pots, cups and saucers for English black tea; smaller teapots and Yunomis for Chinese green tea; pitchers and tumblers for sweet southern tea; mugs for the convenient cuppa on the go.